Most Haunted Place In India you should know about! In Today’s article, we will see India’s most haunted and scary place, that actually gets your goosebumps high. India is the country of king and kingdom.Many of ruler had rule our country for like centuries. There are many fort, forest, and historical sites. They leave a big history for us. We often heard about haunted stories and cursed souls from our ancestors. Many time we won’t believe in all this. But in this article, I am going to tell you about the most frightful place in the world. Once you will read this, its scary enough that you will never have thought of visiting this place. Yes, I am talking about Bhangarh fort which is considered as India’s most haunted place. Bhangarh is located in Alwar district of Rajasthan.It was built by Man Singh, who was Akbar’s general. He built this fort for his brother Madho Singh. It is prohibited to enter in this Fort before sunrise and after sunset. 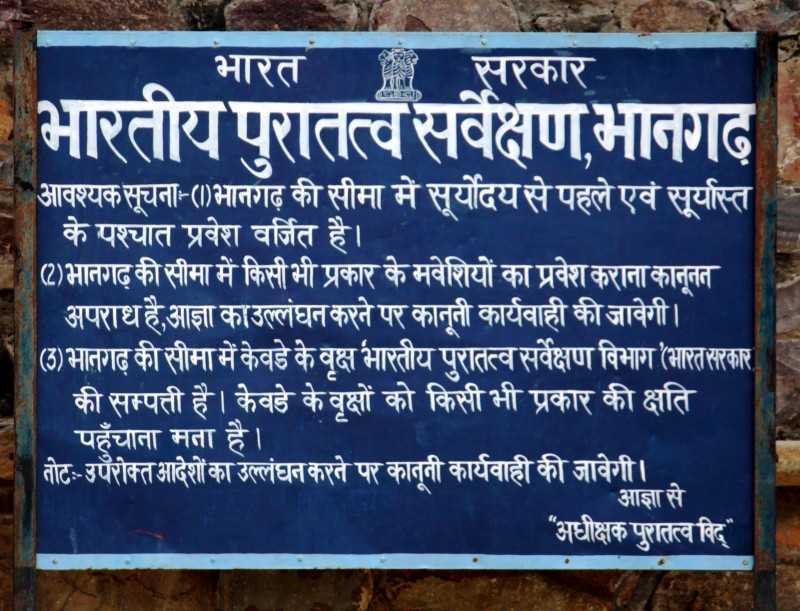 Also, notice board put up by the Archaeological Survey of India(ASI) at the entrance of the fort. There are several reasons behind this mysterious place, as locals refer to this place as haunted and known as “Bhoot Bangala”. It is rumored that tourist who spent a night over there have disappeared mysteriously. One of the reasons behind this fort is. It was built after getting approval from a saint named Guru Balu Nath who lived within that area of the fort. According to common people, the saint said that the fort shadows would not touch his house or would not be taller than his house. As soon as the shadows touched his house, the fort and surrounded area would crumble into ruins. Unfortunately, the king was unable to do so, an entire city gets destroyed and cursed. It is interesting that, even if a roof is built today, it collapses soon after, not any structure able to survive within that area. Another interesting fact about this is, Princess of the fort Ratnavati, who is very beautiful and attractive, many wanted to marry her. One of the tantric named Singhia. Singhia was well known in black magic and fell in love with a princess. When she was with her friends and buying scent, Singhia saw this and did black magic on scent so that princess fall in love with him and follow him. But unfortunately, princess threw the scent on to a stone, which then started rolling down towards tantric and crushed him. Before he died, he cursed the city of Bhangarh to death and no one would able to live there. After some time, a battle was fought between the Bhangarh and Ajabgarh, which led to the death of an entire city and Ratnavati too!. It is said that the ghosts in the fort are those of the princess and people who died in the battle. People have often heard a noise of the child who was crying in the room. But interesting is that that room has no door. The locals claim to have many activities like they heard the sound of bangles breaking, strange music coming out from the fort.Some tourist has felt the strange sensation of being followed by someone. Maybe everyone knows about Gaurav Tiwari, who was the well known paranormal researcher. He also spent the night in Bhangarh fort to ensure that is there really any ghost? Some years later he died mysteriously in his apartment, it is believed that visiting of a fort was the reason behind his death, so think twice before visiting this haunted palace!